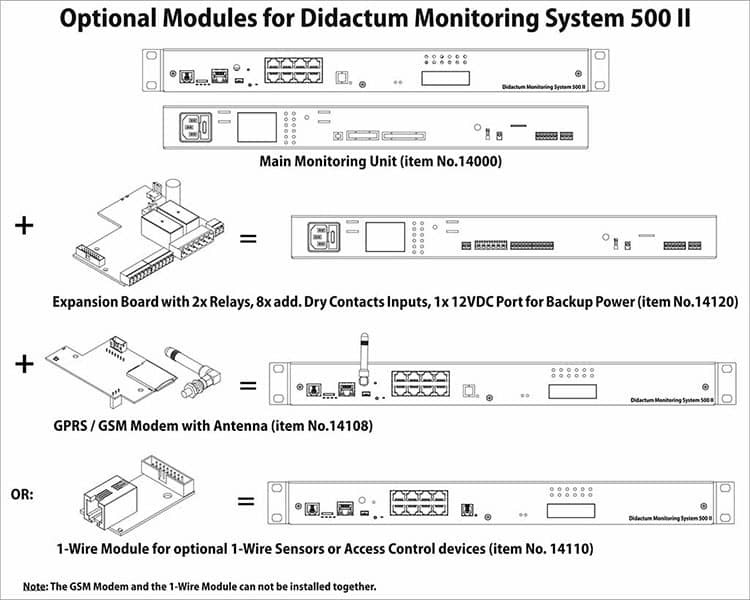 Product information "Monitoring System 500"
With Didactum`s new Monitoring System 500 II you get a proven monitoring solution to protect your mission-critical facilities and remote sites. This monitoring device is applicable across sectors and suitable for monitoring of sensitive IT infrastructure (server room / data center), as well as for production areas and remote technical rooms. 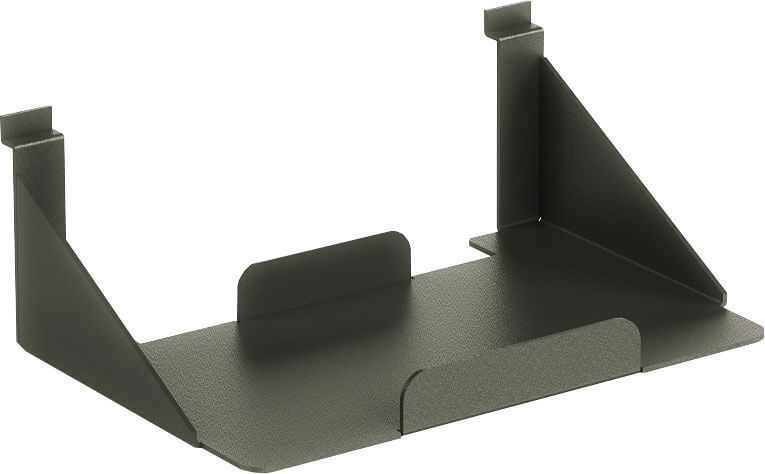 The monitoring system 500 II is a stand-alone monitoring device. Thanks to it`s full SNMPv1, SNMPv2c and SNMPv3 (encrypted) support, this networked remote monitoring unit can be used with SNMP monitoring tools and Network Management Systems (NMS) such as Nagios or OpenNMS and many, many more. This monitoring device has a built-in Web server for easy configuration. It supports standard network protocols such as CAN, DHCP, HTTP, HTTPS, SNMP, SNMPget, SMTP, FTP, Radius, Syslog and TLS. State changes, operating problems and critical events are reported immediately by e-mail, FTP, Syslog or SNMP. If you order the optional Quad Band GSM modem (item No. 14025), this high-end monitoring system also send critical events and alarms via SMS directly to your mobile phone. This is recommended for example in case of malfunction or failure of your network connections. The Monitoring System 500 II provides on the front panel 8 analog sensor ports. 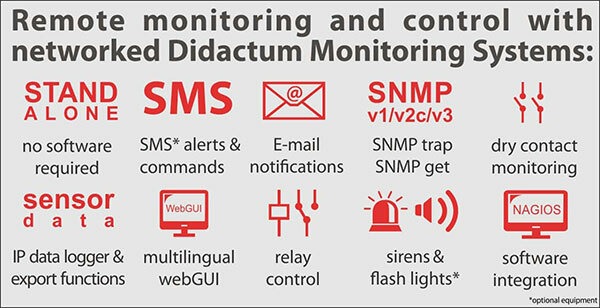 Depending on your requirement, you can choose your individual sensor from Didactum`s extensive range of sensors. Configure your custom SNMP-enabled remote measurement and alerting system with sensors such as temperature sensors, humidity sensors, vibration sensors, smoke detectors, motion detectors, water sensors, magnetic door contacts or voltage sensors. Each intelligent sensor is labelled with a sticker and supplied with a included patch cable and mounting tape. If needed the cable length can be extended on request. Via Autoidentification function, the sensors are automatically recognized by remote monitoring unit and displayed in it`s multilingual Web GUI. Set individually selectable thresholds and limits for each SNMP enabled sensor. Then simply set the desired notifications or alarms. For connection of a larger number of sensors, so you can connect sensor expansion units to the CAN bus port. Use only one serial RJ-12 patch cable to connect CAN sensors and CAN units. For many years CAN bus (Controller Area Network) is a industry proven field bus protocol. The total length of the CAN bus can be up to 305 meters (1000 ft). Ideal for the integration of other critical infrastructure. In multilingual web interface of your network enabled remote measurement system you can easily analyze the sensor data stored in the data logger. Let you, for example, show the temperature profile in the server room or production area and check if the heating, ventilation and air conditioning (HVAC) systems working properly. Quite simply, you can export the recorded data via mouse click as RSS, XML, or CSV files. Ideal for reports in case of audits or checks. This networked rack monitoring system supports you in convergence of house and building technology into information technology (IT). This IP-based remote monitoring unit has 4 inputs for 7/24/365 dry contact monitoring. Connect by 2-wire cable your important UPS system, air conditioning and ventilation system, emergency equipment or fire alert system into your SNMP enabled (Network) monitoring device. Get important notifications immediately by siren, e-mail, SMS (GSM modem required), or by SNMP traps. If you need a higher amount of zero-voltage contacts, just attach the dry contact unit with additional 32 or 64 dry contact inputs. Equip your 500 II remote monitoring device with the optional expansion board. Here, you get 8 additional dry contact inputs, 2 relays and 1 port for Backup battery. The 2 relays can be controlled manually, by SNMP command or by any of Didactum`s sensors. The integrated logic of 500 II remote monitoring unit supports a variety of rules and automatic actions. Here, you can attach a rack cooling system to the relays. If rack temperature gets too high, the Didactum 500 II automatically switches the cooling fans on. The precise Didactum temperature sensor detects a crtical temperature rise in the Server cabinet. To protect the sensitive server and storage equipment, the 500 II rack monitoring system automatically switches on the connected cooling fan systems. The administrators will be alerted by SMS and SNMP traps to Nagios monitoring software. After restoring the desired temperature in 19-inch rack, the fans will are turned off automatically. This example is transferable to other constellations. The integrated relays of opitonal expansion board support applications such as process control and/or power management. 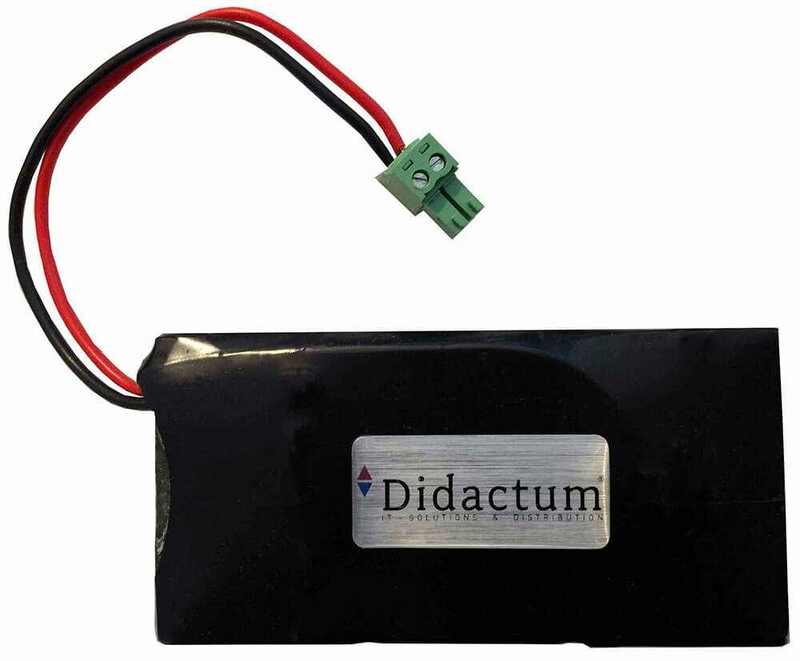 The 12V DC Backup Power input supports Didactum`s Li-ION battery. In case of power failure in server room, data center or production, the 500 II remote monitoring device can continue to work up to 6 hours and can send important notifications and alerts. The 500 II remote monitoring unit can be equipped with an optional 1-Wire board. Here, you can connect up to 20 pcs. 1-Wire temp sensors in series. Each 1-Wire sensor has it`s own SNMP OID and can be polled via network/internet with SNMP tools (e.g. Cacti) or Network Management Software (e.g. HP OpenView, IBM Tivoli, Nagios, OpenNMS, WhatsUp Gold and many more). The total cable length can be up to 100 meters (328 ft). Alternatively, an RFID card reader (item No.14064) or electronic key reader can also be connected to the 1-wire board. Here, you get a proven solution for access control of the computer room and server room. Connect e.g. door locks to the 2 integrated 12VDC outputs of 500 II monitoring appliance. Note: The monitoring system 500 II can be equipped either with a 1-Wire board or expansion board. Both boards can not be installed in one unit. The networked 500 II remote monitoring device provides users with a built-in map function. Here you can integrate the floor plan of your infrastructure. Then you can easly insert the installed sensors into the alert map. Critical events (water leakage, fire, temperature rise, etc.) can be displayed on the alarm map. This monitoring unit provides notifications and alerts such as E-mail, SMS (GPRS / GSM modem required), and SNMP traps. You can also merge Didactum`s intelligent sensors to groups and define logical links for automatical actions. Due to an air conditioning failure, the temperature in server room and server cabinets rises. In the WebGUI of the networked measurement and alert system, you specify that in case of cabinet temperature of 30° C, the connected fan cooling unit must be switched on. Should the rack temperature exceed the critical temperature of 40 ° Celsius, a second fan system should be switched on and the technicians / administrators must be alerted by siren, E-mail and SMS. The OpenNMS network monitoring platform, installed in the headquarter, must be notified by 500 II in form of SNMP traps. As part of your emergency plan, you can create your individual alarm schedules. All events are stored in the syslog of Didactum monitoring device and can be easily exported. The fully SNMP-enabled 500 II remote monitoring unit can be equipped with an optional GPRS / GSM modem. Critical conditions and malfunctions in your sensible infrastructure can be reliable reported via SMS. To do this, simply enter the phone numbers and the names of the recipients. The content of the SMS message can be set individually. The 500 II remote security monitoring units offers integrated macro functions. By using remote SMS command functions, your monitoring system can perfom automatic actions. This is very helpful in case of Network failure or for unmanned locations without network / internet connection. After you have defined the mobile phone numbers, you can send important commands such as switching relays on or off. Each remote SMS command is acknowledged by 500 II remote monitoring device via SMS. With this option, you get for your 500 II remote monitor 8 additional dry contact inputs, 2 relays and 1 port for Backup battery. The 2 integrated (latching) relays can be controlled manually, by SNMP commands or by any of Didactum`s SNMP-enabled sensors. The integrated logic of Didactum`s fully SNMP-enabled 500 II monitoring unit supports a variety of rules and automatic actions. Simply attach a rack cooling system to the relays of this expansion board. If the temperature in cabinet gets too high, the monitoring unit will switch on the cooling fans. The SNMP enabled temp sensor detects a critical temperature in the server rack. To protect the installed server and storage systems, ack monitor will switch on the cooling fans connected. The administrators will be alerted by E-Mails. The headquarter is informed via SNMP traps to installed Nagios network monitoring system (NMS). After restoring the desired temperature in 19-inchserver cabinet, the cooling fans are turned off automatically. This example is transferable to other constellations. The integrated relays of optional expansion board supports important applications such as process control. The 12V DC Backup Power input supports proven Li-ION battery. In case of power failure in server room or production, the 500 II remote monitoring unit is able to run by battery power up to 6 hours. Make sure that you receive important notifications and alerts right out of your computing room or logistics infrastructure. 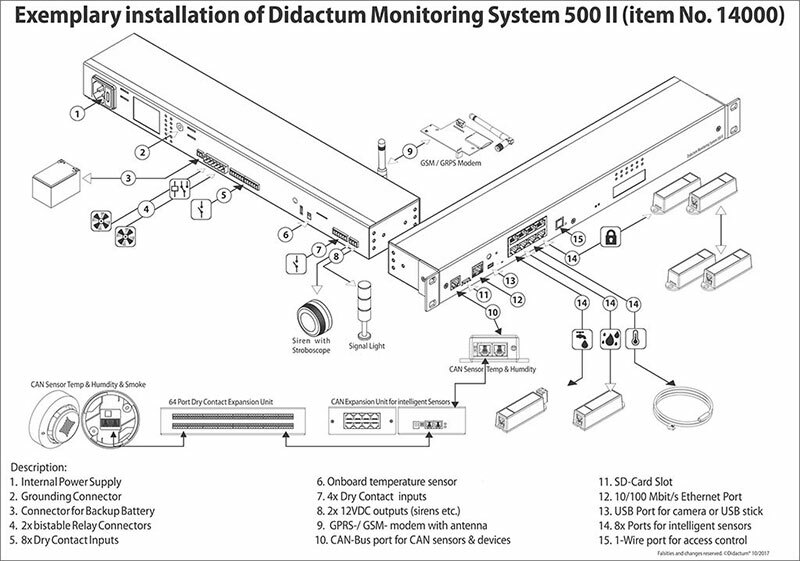 Related links to "Monitoring System 500"
Delivery of this Package: 500 II monitoring unit with C13 power cable, RJ45 cord, manual, terminal plugs, 19“ rack mount angles. Didactum Sensor Temperature: INCLUDED -Didactum Sensor Temperature, 4-wired patch cable RJ11 (2m), screw, double sided mounting tape. Inputs: 8x dry contact inputs, terminal plugs incl. Customer evaluation for "Monitoring System 500"
Excellent monitoring unit. Precise sensors. Fast delivery. Great value for money. Monitoring device is perfect for server room monitoring. Excellent monitoring system. Easy integration into our Nagios. Fast DHL Express delivery. Great monitoring device for server room. Unit worked as advertised. Free Nagios plugin for GPRS modem. We would definitely purchase this again. Good quality. Works as advertised. Was exactly what we expected.